Blackall, a rural town, is in central-western Queensland, between Longreach and Charleville and 500 km south-west of Rockhampton. It was named after Samuel Blackall, soldier and Governor of Queensland (1868-71). Blackall was the administrative centre of the shire of the same name, and continues that function with the Blackall and Tambo Regional Council (2008). Blackall is situated on the Barcoo River, in an area explored by Thomas Mitchell in 1846 and Augustus Gregory in 1858 and thus known by the 1860s to be both favourable to grazing and desolate in drought. Pastoral settlement was active in the 1860s, and a rudimentary village settlement evident by 1867. Local government was established in 1879 with the Kargoolnah division, headquartered in Blackall. By 1877 the town had upwards of seven hotels, seven stores, several tradespeople and a school (opened that year). The town's newspaper, the Barcoo Independent, began publication in 1889. During the 1880s some of the large pastoral runs were subdivided for selection for grazing and dairying. There was a run of fairly good seasons, and the drilling of Queensland's first artesian bore at Blackall in 1885 brought relief to thirsty stock. At the end of the 1890s the 'federation drought' took hold, followed by flooding of the Barcoo in 1906. Nevertheless, provision against the vagaries of the surface water supply was made by the sinking of further bores and construction of tanks. 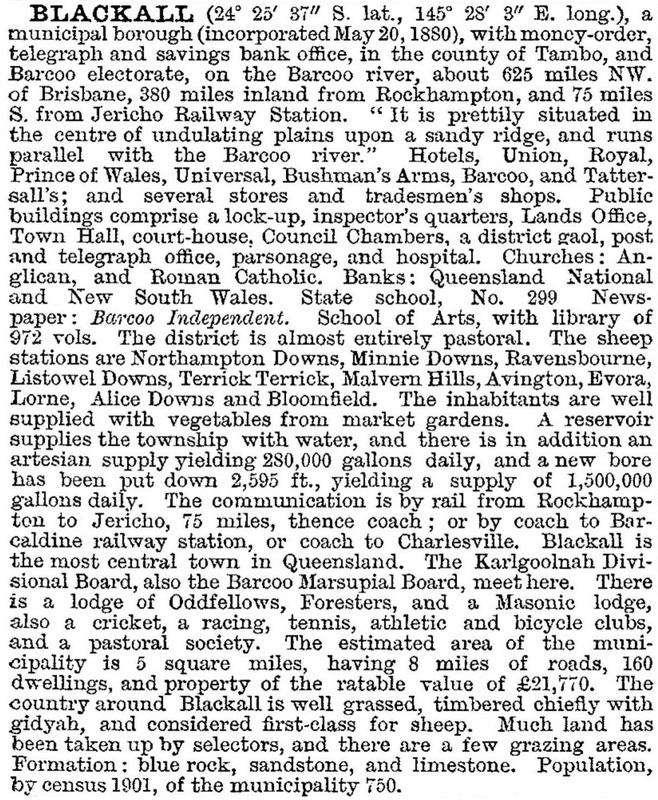 The Handbook's description omitted mention of one of Blackall's most famous events, when the mighty Jack Howe hand shore 321 sheep in seven hours and forty minutes on 10 October 1892 at the Alice Downs pastoral station, 19 km north of Blackall. The world record stands, and was not broken by machine shearing for 58 years. A Howe sculpture was unveiled in Blackall's business centre in 1988. Within a year of the formation of the Kargoolnah division Blackall was established as a separate municipal borough. There were periods of uneasy stand-off and cooperation between the two authorities, mainly over shire contributions to town amenities in the event of amalgamation, which nevertheless occurred with the formation of Blackall Shire in 1945. The postwar wool boom and a succession of good seasons positioned Blackall for strong growth. A State high school opened in 1957, a motel in 1962, the main street saw a building boom. Population peaked, but drought came in 1965, followed by the wool price collapse in 1967. The town's population dwindled by a third between 1961 and 2001, and the shire's nearly halved; the non-town population went from 1100 (1961) to 370 (2001). Blackall has a showground, racecourse, golf course, bowling club and aquatic centre. There are four churches, five hotels and two motels, partly a testament to Blackall's position on the Landsborough Highway tourist route to Longreach. In times past, the road was 'beyond the black stump', a reference to the black stump survey marker in Blackall used for survey purposes in the 1880s. Blackall also has a hospital, a Catholic primary school (1917), the State primary and high schools, a cultural centre and an historical association. A two-storey, verandahed tin and timber Masonic temple (1908) is listed on the Queensland heritage register. The local Barcoo Independent is published fortnightly. To the town's east lies 'Black's Palace', a significant complex of Aboriginal drawings and artefacts. The Seymour Department Store closed in 2012 after trading in the town for more than fifty years. In 1993 Blackall Shire had 67,000 beef cattle, 458,000 sheep and 159,000 lambs. The town's history was celebrated in a number of ways in the twenty-first century. A bronze statue to Blackall's Edgar Towner who won the Victoria Cross in 1918 for bravery in a battle in France was unveiled in 2009. A community group, the Blackall Historical Society, completed the mapping and electronic register of over 2000 graves, some dating back to the 1880s, in the Blackall cemetery in 2011. A new racing pavillion (2013) at the Blackall Racecourse was named in honour of local jockey and trainer Charlie Prow. The Queensland Governor unveiled an Engineering Heritage National Marker at the Blackall Woolscour tourist facility in 2014. Regularly subject to debilitating droughts, a handful of homes in the town were flooded in 2012 when the Barcoo River flooded. In 2008 Blackall Shire (16,384 sq km) was united with part of Tambo shire (14,105 sq km) to form Blackall and Tambo Regional Council.